Approximate historical distribution of Semitic languages. East Semitic in green. 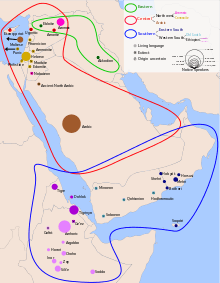 The East Semitic languages are one of six current divisions of the Semitic languages, the others being Northwest Semitic, Arabian, Old South Arabian (also known as Sayhadic), Modern South Arabian, and Ethio-Semitic. The East Semitic group is attested by two distinct languages, Akkadian and Eblaite, both of which have been long extinct. They stand apart from other Semitic languages, traditionally called West Semitic, in a number of respects. Historically, it is believed that this linguistic situation came about as speakers of East Semitic languages wandered further east, settling in Mesopotamia during the third millennium BCE, as attested by Akkadian texts from this period. By the beginning of the second millennium BCE, East Semitic languages, in particular Akkadian, had come to dominate the region. They were influenced by the non-Semitic Sumerian language and adopted cuneiform writing. Modern understanding of the phonology of East Semitic languages can only be derived from careful study of written texts and comparison with the reconstructed Proto-Semitic. Most striking is the loss of the glottal stop, or aleph, and the voiced pharyngeal fricative, or ayin, both of which are prominent features of West Semitic languages (for example, Akk. bēl 'master' < PS. *ba‘al). Also, East Semitic languages do not possess a series of three back fricatives: *h, *ḥ, *ġ. Their elision appears to give rise to the presence of an e vowel, where it is not found in other Semitic languages (for example, Akk. ekallu 'palace/temple' < PS. *haykal). It also appears that the series of interdental fricatives became sibilants (for example, Akk. šalšu 'three' < PS. *ṯalaṯ). However, the exact phonological make-up of the languages is not fully known, and the absence of features may have been the result of the inadequacies of Sumerian orthography to describe the sounds of Semitic languages rather than their real absence. ↑ Hammarström, Harald; Forkel, Robert; Haspelmath, Martin; Bank, Sebastian, eds. (2016). "East Semitic". Glottolog 2.7. Jena: Max Planck Institute for the Science of Human History. Huehnergard, J. 1995. “Semitic Languages.” Pp. 2117–2134 in Civilizations of the Ancient Near East. Jack Sasson (editor). New York.